Trainer Nigel Twiston-Davies was thrilled for stable amateur Ryan Hatch after he steered Same Difference to a head victory in the Fulke Walwyn Kim Muir Handicap Chase. "It was a tremendous ride by young Ryan and it's not the easiest on a first season novice against handicappers. 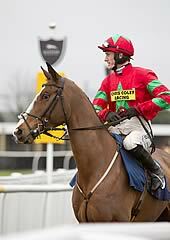 He had to be a good jockey and he was," said Twiston-Davies. "Same Difference tends to jump a little bit to the right, so we put the headgear on to stop him doing that and its worked. "He is very brave and a fit young jockey was needed to get him home. Ryan is nearly a member of the family and grew up with my boys. He has been with us since he was 16 and he is best friends with my sons Willy and Sam. You couldn't find a harder-working, more lovely bloke. It's a lovely day. "Ryan has developed his riding in a short space of time and he doesn't get as many chances as I would like but with my boys there, they have always had first shout. "When you're having winners for friends at your local track, it's what really counts. "He ran 19 days ago in the Racing Plus Chase and ran a really good race. I thought coming here after that might be a step too much but it wasn't." Ryan Hatch, 19, a local lad from Hartpury in Gloucestershire, rode his first Festival winner when Same Difference, trained by Nigel Twiston-Davies, put his nose in front on the line in the Fulke Walwyn Kim Muir Chase. The runner-up, beaten a head, was Super Duty ridden by Ireland's top amateur Derek O'Connor, a scalp that was not lost on the winning teenager. Hatch, who rode his first winner at the track in October on the Twiston-Davies-trained Hunters Lodge, was briefly lost for words when reflecting on today's success, but gathered his composure and said: "You dream of that and it's unreal. I wanted to bounce out in front, but became short of room on the inside and had to take him back a step. I had to suffer in mid-div for a circuit and he travelled okay, but I was slapping him trying to get him to take hold of the bit. "On the second circuit, he saw a bit of light and came back on the bit, then I squeezed him down the back and he finally took off coming down the hill, at which point there were just two horses in front of me [including Super Duty]. He just kept battling from there. He's a superstar and gave me a helluva ride." A photo-finish was announced, and Hatch admitted: "I didn't dare believe I had won. I knew I was up against Derek O'Connor, the top boy in Ireland, and when the result was called it was a fair relief." Hatch rode ponies in gymkhanas as a boy and joined Twiston-Davies three years ago upon leaving school. He said his father, John, "was a jockey and a stunt man on horses". He plans to turn conditional at some point, and said: "Nigel has been really good to me, giving me rides throughout the season. I'm very grateful to him. "I have ridden the likes of Battlecry and Hunters Lodge. "Hopefully, I can kick on and become a professional next year - that is the aim." However, there was a downside for the elated rider - he was suspended for nine days and fined £400 for using his whip above the permitted level on the winner. Irishman Derek O'Connor is one of the most highly regarded amateur riders and he certainly has the temperament to go with his considerable talent, taking his head defeat on the front-running Super Duty with good grace. After being beaten on the line by Same Difference and Ryan Hatch, O'Connor said: "It's a huge shame because he was so professional all the way round. I'm just disappointed for the horse - I'll get over it! "He's going to be a really high-class chaser and his owners will have a huge amount of fun with him in the years to come." Super Duty's trainer Donald McCain added: "If the last fence hadn't been cordoned off it would probably have helped us as his jumping was so good. He just lost a few strides turning in but he's run brilliantly." J T McNamara, injured when Galaxy Rock fell at the first fence in the Fulke Walwyn Kim Muir Challenge Cup, was attended and assessed by doctors before being airlifted to hospital by air ambulance for further assessment and treatment. The 37-year-old rider's transfer from one of the course ambulances to the air ambulance caused the delay of the Glenfarclas Cross-Country Chase, which was due off at 5.15 and put back to 5.40. The Kim Muir Amateur Riders’ Chase was introduced to the National Hunt Meeting in 1946 by Mrs Evan Williams, sister of Kim Muir, a young cavalry officer who lost his life in the early years of the Second World War. The addition of Fulke Walwyn to the title of the race occurred in 1991, reflecting the career of Cheltenham's most successful trainer. Walwyn trained 211 winners at Cheltenham and 40 at The Festival - his haul included four Gold Cups, two Champion Hurdles and seven Cathcart Challenge Cups. His Festival total was a record until Nicky Henderson surpassed the mark in 2012. The Fulke Walwyn Kim Muir Handicap Chase now has a safety limit of 24 and a maximum field has gone to post in five of the past six renewals, while 26 ran in 1989. Just six horses lined up in 1950. Arctic Gold defied 12st 3lb in 1954, while Jack Tatters scored off 12st 2lb in 1949. 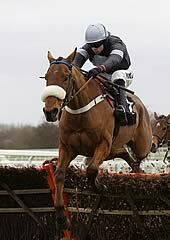 More recently, both Character Building (2009) and Ballabriggs (2010) carried 11st 12lb to victory. In Truth won under 9st 9lb in 1998. There have been two dual winners - Chu-The (1967 and 1968) and Glyde Court (1985 and 1986). Fred Rimell saddled four winners - Mighty Fine (1951), Gay Monarch II (1955), Nicolaus Silver (1961) and Double Negative (1977). Nicky Henderson is the most successful current handler with three wins to his name - Master Bob (1990), The Bushkeeper (2002) and Juveigneur (2005). Eight amateur riders have recorded a pair of wins in the Fulke Walwyn Kim Muir Handicap Chase, including Richard Burton (Juveigneur (2005) and Cloudy Lane (2007)), Richard Harding (You're Special (2006) and Ballabriggs (2010)) and Jamie Codd (Character Building (2009) and Junior (2011)). Irish-trained horses have prevailed on five occasions. The most recent was Greasepaint, who scored for Michael Cunningham in 1983. BETTING Lochroe won at odds of 10/11 in 1958, while Royal Predica (2003) and You’re Special (2006) were both successful at 33/1. Most of the top amateur riders appear in the winners’ list, including some subsequently well-known professional jockeys and trainers. Gay Kindersley, John Oaksey, Nick Gaselee, Roger Charlton, Michael Dickinson, Ridley Lamb, Ted Walsh, Jim Wilson, Simon Sherwood, Gee and Marcus Armytage, Robert Thornton, Adrian Maguire, Seamus Durack, Ken Whelan, David Crosse and Robert Walford are among the familiar names. Cool Ground is the only horse to have progressed from winning this handicap to a Betfred Cheltenham Gold Cup victory. Nicolaus Silver and Ballabriggs both subsequently won the John Smith’s Grand National after capturing the Fulke Walwyn Kim Muir Handicap Chase, while last year’s winner Sunnyhillboy was beatena nose in the Aintree race.